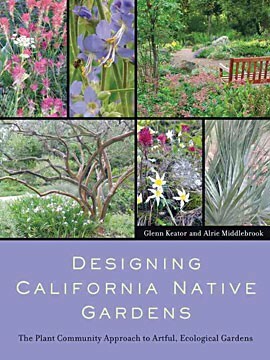 'Designing California Native Gardens: The Plant Community Approach to Artful, Ecological Gardens,' by Alrie Middlebrook and Glenn Keator. On Wednesday, March 12, 2008, native plant designer Alrie Middlebrook will give a talk on designing native gardens. She's the co-author of Designing California Native Gardens: The Plant Community Approach to Artful, Ecological Gardens, just out from University of California Press. She runs a native plant design business in San Jose called Middlebrook Gardens, and she's the founder of the California Native Garden Foundation (www.cngf.org). Anyone who gardens with California natives knows that a plant native to southern California is practically exotic here in Humboldt. That's what makes Middlebrook's book so useful: She divides it into plant communities, devoting one chapter to redwood forests, another to coastal bluffs and so on. Her talk, which is sponsored by the North Coast chapter of the California Native Plant Society, will be held Wednesday at 7:30 p.m. at the Six Rivers Masonic Lodge at 251 Bayside Road in Arcata. Admission is free; for details, call 822-2015. I caught up with Middlebrook last week and asked her about her approach to natives and design. NCJ: What can people expect from your talk next Wednesday? Middlebrook: I give these talks all over the state and I focus on the region that I'm speaking to. In this case, I'm going to be talking about the plant communities that are in the Humboldt County area. I'll show photographs of gardens that we have created or other people have created using plants that naturally grow in Humboldt. But once a garden is in, you also need to know how to manage it. I talk about how to conserve rainfall and other sustainable practices. For instance, I discourage the use of cement, because the manufacture of cement is a major contributor to global warming. So I'll offer other suggestions for materials that are more sustainable for hardscape. And sustainability is also about using solar in the garden for fountains and lighting, incorporating edibles, using local art in the garden and all kinds of alternative construction methods. NCJ: So your book is divided into different plant communities, and Humboldt's a pretty diverse place. Which of those communities do we find here? Middlebrook: Well, your primary community is, of course, redwoods. But then you've also got coastal bluffs, coastal prairie and inland you'll have mixed evergreen woodland. And what you're doing when you garden with natives is you're actually putting the plants back that evolved in that area where you lived. NCJ: So my neighborhood, for example, was a redwood forest a hundred years ago, but it's been cut down to build houses. What plant community would be right in my garden? Middlebrook: You could still plant a redwood tree, or a grove of redwoods. If you live in an area where redwoods used to grow, that's a system that's only been interrupted for a short period of time and it will come back. NCJ: Uh, so let's say I don't have room for a redwood grove. What are my other options? Middlebrook: You can also plant what naturally grows on coastal bluffs, or a little further inland, where there will be a lot of grasses. Part of it is knowing how to read the landscape. NCJ: What about mixing natives and non-natives? You see a lot of Mediterranean plants around here, and rhododendrons and camellias are very popular. Middlebrook: When we come in and bring in plants from other cultures, we really upset the natural system. When I'm bringing in exotics, like Mediterranean plants, for example, I treat them as exotics. I might group them together, put them in containers, or have them as a display garden. NCJ: The design aspect of this is very interesting to me. There's a photo in your book of a very boxy, modernist home with three very boxy terraces, and there's just one grass planted over and over. It's very sculptural, and it really seems to work with the house, but they're using natives. I'm really drawn to that because it seems to say, "I meant to do this," not "I've just stopped mowing my lawn." In certain kinds of neighborhoods, I could see how this would be a good approach. Middlebrook: The reason you're drawn to that is that it's very manipulated, very repetitive, very controlled. When you take a plant and repeat it over and over, that's called a monoculture. We're invited to monoculture because what we want to do as a species is we want to manipulate and control our environment. That's modernism — you take a box, repeat it, and repeat that grid in the landscape. It has clean lines. You can see the shape and form of the house. It's all one color and shape. That's very contrary to the natural world, which is based on diversity. I look at that photo and ask: I'm a bird. Would I find this attractive? Not all birds eat that Idaho fescue. How is that pollinated? So in the rest of the garden, I'd add a lot of diversity to create a balance and live lightly on the earth. I don't want to discourage diversity. I don't want to be part of the generation that saw the demise of songbirds in the Midwest because everybody planted lawns and there wasn't enough seed for birds to eat. I got into these plants because they are really beautiful, but now people are coming to native plants to restore diversity and conserve water. But the gardens are still really beautiful, too.